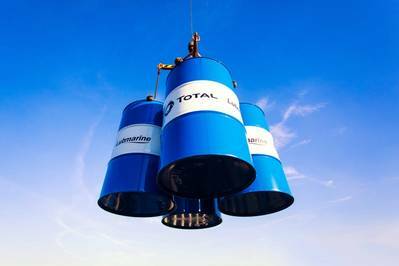 Total Lubmarine has announced the introduction of a new grease product: BIO OG PLUS – an innovative addition to an already comprehensive Environmentally Acceptable Lubricant (EAL) range. Specifically formulated for sensitive applications such as open gears and chains under high load, BIO OG PLUS mitigates the challenges of working in environments where water contamination is common. On top of being an extreme pressure and adhesive grease, BIO OG PLUS’s biodegradable qualities allow owners, managers and operators of vessels to take a more environmentally considerate approach to lubrication. It is also a vital resource to those operating in areas requiring the use of EAL Lubricants, such as those working within jurisdiction of the US. As a key player in EALs for over two decades, customers can remain confident in Total Lubmarine’s credentials and experience. To date, more than 1500 vessels utilise Total Lubmarine’s EAL products. BIO OG PLUS is being rolled out to strategically located ports around the world.